Polystyrene Causes Cancer and Messes with Your Hormones! Styrofoam and other polystyrene plastics have been enjoying a bit of notoriety this year. Earlier this year styrene (the building block of polystyrene) was finally listed as “reasonably anticipated to be a human carcinogen” by the National Research Council, a designation long fought by the styrene industry. More recently polystyrene, the primary building block of expanded polystyrene foam (a.k.a. styrofoam*) and other plastics, was found to seep estrogen when exposed to heat and UV light. That styrofoam takeout container isn't just carcinogenic. It's messing with your hormones too! In addition to causing detrimental human health effects, polystyrene products have numerous detrimental effects on the environment. The polystyrene manufacturing process creates large amounts of liquid, solid, and gaseous hazardous waste. Styrene plastic products are almost never recycleable and will persist for hundreds of years in landfills. Foam litter is notoriously difficult to control. Polystyrene foam breaks apart easily and its lightness allows it to be readily dispersed by the wind, which is especially problematic and expensive for cities that need to limit trash in waterways. 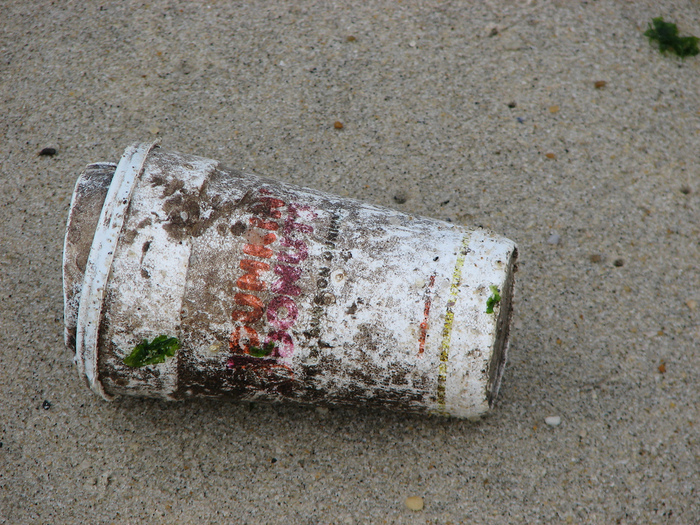 In California, styrofoam accounts for 15% of storm drain litter and is the second-most-common type of beach debris. It is also frequently mistaken for food by animals and seabirds. Due to these issues, dozens of cities have banned expanded polystyrene foam all together. Eventually, I'd love to see this toxic plastic banned everywhere, but until then, here are some ways you can keep polystyrene's toxic chemicals out of your body and the environment. Avoid meat packaged on styrofoam trays. Plenty of meat is packaged simply in clear flexible plastic these days. I stopped buying organic chicken at Trader Joe's and ground turkey from Costco because of the styrofoam trays. Now I get my organic chicken at Costco and ground meat packaged in plastic tubes instead of styrofoam trays either through my CSA or at Whole Foods. You can also purchase meat from the butcher counter to avoid styrofoam trays. Another option is to eat less meat (or no meat!) to limit your exposure. Don't get take out in styrofoam containers. Before asking the restaurant to wrap up your leftovers, check if they use styrofoam containers. If they do, ask if they can use something else instead. Or just forgo taking home leftovers (honestly, how often do you end up eating them?) and order less next time. If your favorite takeout restaurant uses styrofoam containers, consider bringing your own containers. I brought Pyrex containers to my favorite Thai restaurant to package up my takeout when I was pregnant. It was a small family-owned place, and they didn't seem to mind. We also bring our own reusable cups (and straws!) to Jamba Juice to avoid their foam cups. Invest in a reusable mug or bottle for hot drinks. Heat and styrofoam are a bad mix. Nobody wants a dose of carcinogenic styrene in their beverage. Invest in a reusable insulated mug instead. Don't purchase products made of polystyrene. For example, don't buy polystyrene disposable dishware for your celebrations and get-togethers. It's harder than you think! I've known for years that styrofoam (along with PVC) was one of the worst plastics, and have long avoided foam plates, bowls, cups, and containers. But it wasn't until Plastic-free Beth pointed out to me that all #6 plastics contain styrene that I realized I shouldn't be using those ubiquitous tall red plastic cups either. Use reusable dishware when you can, and eco-friendlier disposable alternatives (such as bamboo, compostable, or corn-based plastics) when you can't. Skip the craft projects that use styrofoam, and avoid purchasing any other product (especially those to be used by pregnancy women or small children) made with polystyrene (#6) plastic. Keep styrofoam packaging out of your home. Open all appliances outside or in your garage if possible. Any time I discover that packaging involves styrofoam it is immediately ushered outside of the house. There is something irresistible to children about the texture and feel of styrofoam. I've had babies chew on foam peanuts. And the huge blocks used around appliances break into little pieces so easily and then get everywhere and are so difficult to clean up. Seek out products packaged in eco-friendly materials or buy used to avoid packaging all together! 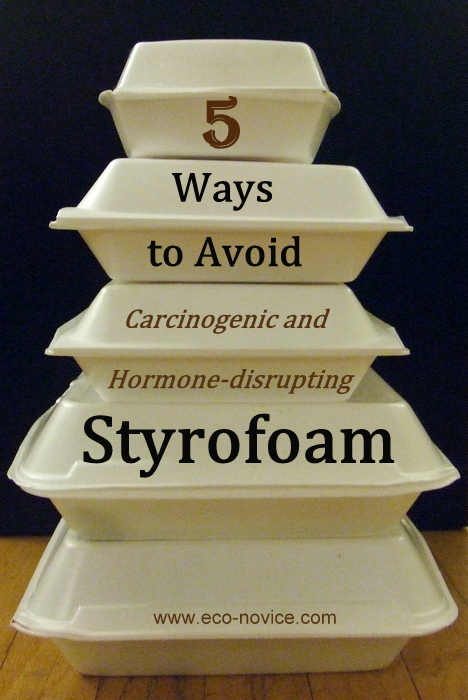 How do you avoid styrofoam? *Note: While Styrofoam is actually the trademarked name of a specific polystyrene foam product never used in food containers, in the popular lexicon, Styrofoam is used to describe anything made of polystyrene foam. It is in this sense (styrofoam = polystyrene foam) that I have used the term styrofoam (lowercase "s") in this post. It's hard to believe that some restaurants are still using Styrofoam! It's been a while since I've seen that. I mainly see Styrofoam cups for take-out coffee and hot chocolate when we're skiing. We'll have to bring our own reusable mugs this year. Taking your own reusable mug skiing - that would require some serious eco-dedication! I had no idea that it was so bad for us - I knew it was terrible for the earth. I have actually been seeing more, not less styrofoam in the last few years. Cups cropping up at various functions and stuff. Indeed. Like so many other things, what's good for us is good for the earth, and vice versa. I used to do a really good job but lately not so much. I need to get back to using my reusable coffee mugs when I get coffee out. That's the only time really that I end up with styrofoam, thankfully that doesn't happen too often. Luckily in Portland where I live, Styrofoam seems to be very unpopular and people use paper for their disposable needs. Sometimes it comes into my house via packaging in shipments and then I try to find someone else who can use it instead of just tossing it out. Yes, many post offices will take styrofoam peanuts to be reused for packaging, I believe. But what to do with those giant blocks that come around appliances??? I hadn't given much thought to styrofoam as I rarely see it. With the holidays coming it's such a good tip to take out any packaging to open. Thank you! Thanks for this informative post. I knew how bad it was for us and the Earth, but I appreciate the tips to reduce. My weakness? When my husband and I are beat after long work days we sometimes like to treat ourselves to delivery. There is one local Thai place that uses styrofoam and I haven't asked them about alternatives. I suppose I could go pick up instead of delivery and bring my own glass containers. The other side is that if everyone drove to pick up their food that would increase traffic and carbon footprint. One delivery car goes to several locations. I know, I know, stop ordering out. It is my weakness during the winter every so often. Not that it makes it any better, but I have been washing and saving any containers I get and using them at school to make stamps, for paint mixing, etc. At least that is better than buying craft supplies. But still need to stop making the styrofoam.